Commodities continue to climb with several commodities making new highs for the year. The equities market continues to push higher with 3rd quarter earnings coming in better than expected. This good news has aroused more investors to put what’s left of their money back into the market which has been the fuel for this recent rally in stocks. The market continued to make a new yearly high last week, company earning are better than expected and more retail investors (average working people) are dumping their money back into the market again because EVERY thing is going up in value and all they need to do is buy something. When it’s this easy to make money in the investment/trading world something drastic usually happens not long thereafter. 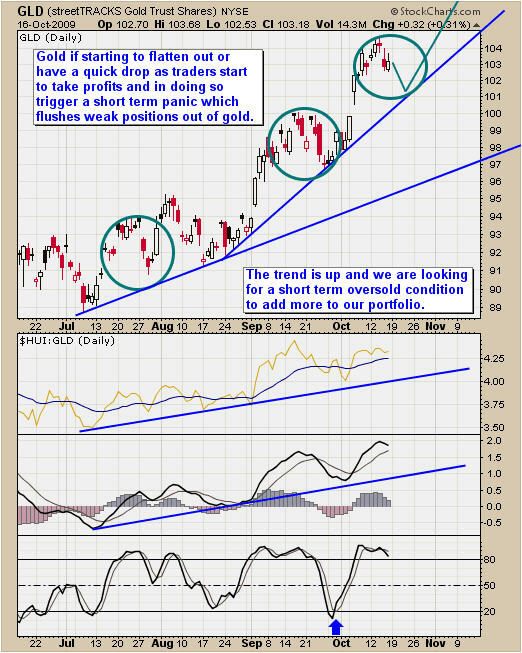 Here are a few charts for this week in precious metals and energy. 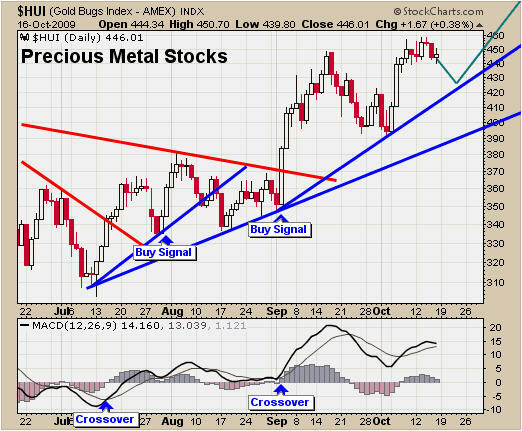 Gold stocks have performed well in the recent couple weeks. I figure we will see some sideways price action before another leg higher. The question is how far will this pullback go? As you can see there are two trend lines which make for solid support levels. I will be looking for a low risk setup around those levels. Gold had a great pop higher the first week of October but now it looks ready for some sideways chop. I tend to look at precious metal stocks as a leading indicator for trading gold so before we put more money to work in GLD I want a buy signal for gold stocks also. 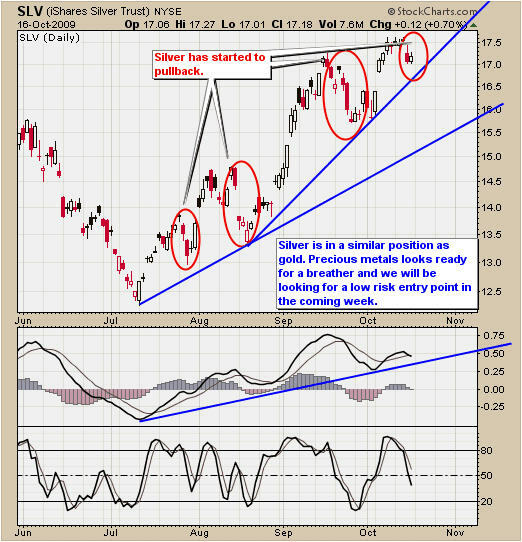 Silver SLV and gold GLD generally move together with silver being the more volatile of the two on a percentage basis. As you can see from the chart below the support trend lines are much father away from the current price. If you don’t want to give back too much of your gain then raising your stops is a safe call. But if you get taken out of your position you should be looking to get back in at a lower price on the first sign of a bounce/reversal to the upside. It does not matter which sector or commodity I am following it is important to analyze the stocks for that sector or commodity. These are as close as you can get to a leading indicator for possible trade setups. 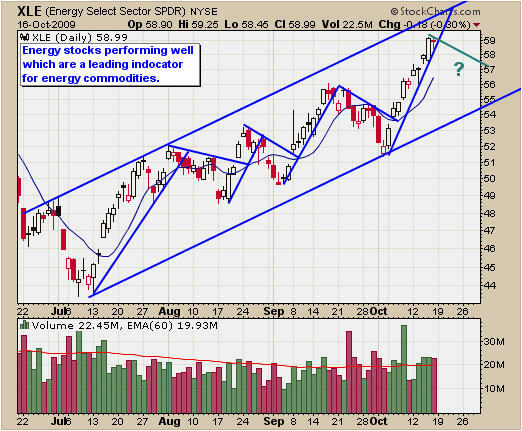 In my opinion, it looks like energy stocks are about to have a pullback. The trend is still up, so I am not looking to short, rather I am tightening my stops to lock in some profits if we get a sharp pullback. Then I will be entering long again on the first sign up a reversal back up. Oil had a great run last week and from the simple analysis above (energy stocks) I have a feeling we could see a quick one day sell off. 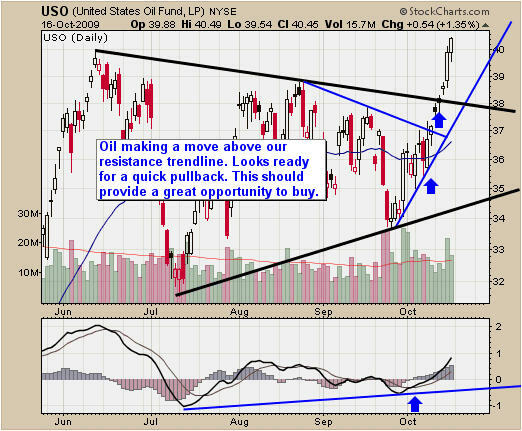 This is common with USO and buying at the close after a long high volume sell off can provide an excellent trading opportunity. 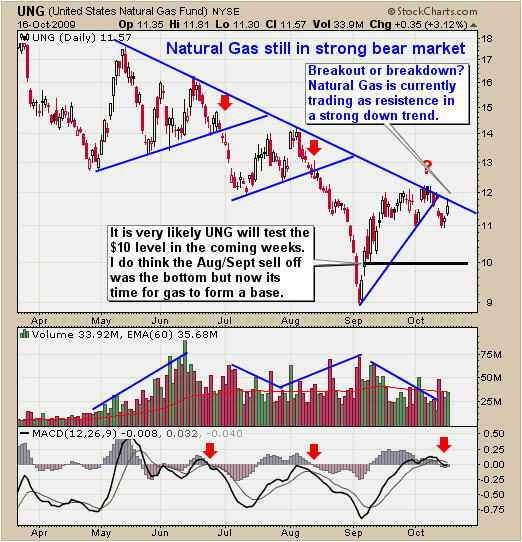 Natural gas continues in a bear market rally as it tests our resistance trend line on Friday. I do feel that gas has bottomed and we will see much higher prices in the future. That being said, I still think we need some time for this commodity to bottom (form a base). Depending on the price action of natural gas this week, we may have a low risk entry point with my trading model. I will keep members posted. In short, I feel the market is ready for a multi month correction, but with solid 3rd quarter earnings, new money is being dumped into stocks and commodities as investor confidence rises. This is extending the rally making it even more over bought in my opinion. That being said, I will not be shorting the market or stocks anytime soon. This market can continue higher because average investors are putting their money back into the market. If the market does actually top in the coming weeks, there will be plenty of time to short the market using leveraged ETFs. I am still long the market and applying tight stops to my positions. Chris Vermeulen is Founder of the popular trading site TheGoldAndOilGuy.com. There he shares his highly successful, low-risk trading method. For 6 years Chris has been a leader in teaching others to skillfully trade in gold, oil, and silver in both bull and bear markets. Subscribers to his service depend on Chris' uniquely consistent investment opportunities that carry exceptionally low risk and high return.